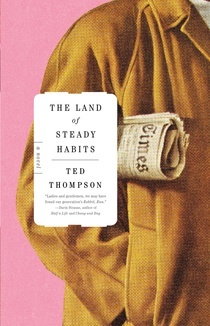 Ted Thompson’s novel In the Land of Steady Habits was described as a “elegiac yet bighearted take on adult disillusionment” by The Wall Street Journal. Ted Thompson is the author of The Land of Steady Habits, a novel that has been called “the first great novel about post-crash American disillusionment, the flip side of The Wolf of Wall Street” by Salon editor David Daley. The novel has been optioned by director Nicole Holofcener. 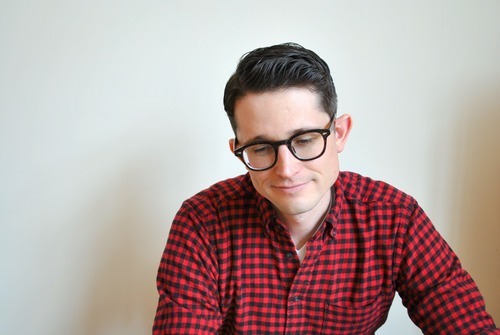 Thompson’s stories have appeared in Tin House, American Short Fiction, and Best New American Voices, and he was a Truman Capote fellow at the Iowa Writers’ Workshop. He lives in Brooklyn, NY with his wife. In this interview, Thompson discusses how to structure multiple points of view, creating tension, and writing in the shadow of Yates, Cheever, and Updike. To read the first chapter of In the Land of Steady Habits and an exercise on making characters uncomfortable, click here. I’ve read a lot of novels written from multiple points of view lately, and most develop a sequence for the different POVs—for example, every other chapter follows a different character. But you don’t do that in this novel. Part 1 is told entirely from Anders’ point of view, but then the chapters in Part 2 are told from not only Anders’ POV but also his wife Helene’s and his son Preston’s. The last section mixes the POV’s within a single chapter. When I first encountered the POV shift, some small part of me thought, “Hey, that’s not supposed to happen.” But then it worked. And the other shifts worked. I came to appreciate the way you handled them. Rather than latching onto a pattern, you shift POV only when necessary—at least that’s how it seemed to me. What went into your decisions about when to shift? I’m so happy that you noticed that. It was something I came to rather late in the process of writing the novel. Originally it had been told entirely from Anders’ point of view, and draft after draft I was always chafing against that. It was too restrictive to tell the entire story through his consciousness, especially because he’s a character who often reacts before he understands his feelings, who doesn’t have the most awareness, and that made him a somewhat trying person to spend a lot of time with. But I had always believed that if you were going to change points of view in a novel you had to teach the reader that you were going to do that early on. As you say, it had to be established in the opening pages. But I didn’t want to do that, because to me the story begins with Anders and his crisis but then opens up from there to show how it affects the people and community around him. To me it was a little like a stone thrown in a pond. The opening is the splash and after that we can follow each of the waves that come off that impact. So I looked at the novels I thought of as structurally perfect, or at least those that had influenced me, and discovered that not all of them had formal, logical ways of handling POV. Revolutionary Road in particular wanders all over the place. At first it seems like it’s going to be Frank’s story, but then we get his wife April, and then we jump to Mrs. Givings, the real estate agent, then their neighbor Shep Campbell. We even wander into Mrs. Givings’s deaf husband’s point of view at the very end. And it was then that I realized that so long as there is a narrative question (meaning a question that is in the reader’s mind) that’s being addressed, most of the time the reader will make the POV leap with you without too much resistance. Changes in point of view are always jarring, but they’re less so if it feels as though we’re following the narrative thrust of the story, if we’re where the action is. So what I told myself was that I would go to the character who held the most interest to me in that moment, and figured (hoped) the reader would also share my curiosity. What I found was that these shifts could be fluid so long as the scene or moment or information we were getting deepened our understanding of what we’d already seen. The moment a POV shift dies is when the character reason for joining a character isn’t immediately clear. Then, for the reader, the move feels lateral rather than forward. On a similar note, I was also interested in the way you move around in time. Some chapters are in the present, some take place in various points in the past, and some move unexpectedly between the two. One of my favorite parts of the novel comes in the last paragraph of Chapter Two, when the past and present are collapsed together in a moment of regret. I can only imagine what this novel looked like in draft form—the many scenes spanning decades, waiting to be fitted into a single narrative. How did you go about finding the novel’s organization? For me the simplest organizing principle for this novel was always the present events. Essentially once we know where we are in time, in the present story, and what matters there (once there’s conflict) then it opens all sorts of space to play. I say “play,” but really what I mean is an opportunity for contextual information, for a wider lens through which to understand the events. So since my novel has a character who has left a forty-year marriage and a long career, part of what that second chapter had to do was provide the context of that huge sweep of time, to help us place him more clearly in the present, and thus deepen the novel’s conflict. I’ve come to see conflict less and less as an aspect of present confrontation in fiction and more as an expression of character. In deepening the conflict, a literary novel is also deepening our understanding of character. They’re the same thing. So the present line of tension, for this book, was always the organizing principle, but once it was tacked down, I could go wherever I needed in time to make the most sense of the moment for myself and for the reader. The writer Richard Bausch once told a workshop I was in that “drama in fiction is created by what is known, not by what is unknown,” and I agree with that wholeheartedly. For me with this book it was just a matter of finding the present events, then stepping away from them when it was necessary to give the reader enough context to understand precisely why they mattered. Someone described the novel’s main character, Anders Hill, as a one-percenter—it may have been a reviewer, or it may have been another character in the book. I can’t remember. But one of the interesting things about the novel is that Anders never feels like a one-percenter. His life has become such a mess that even though he spent much of his life riding the sweet spot of the economic wave (and also crashing, like many others), he doesn’t feel wealthy. Did you ever struggle to find the right tone for the wealth surrounding Anders and his community? Ted Thompson’s novel, The Land of Steady Habits, has been shortlisted for the Flaherty-Dunnan First Novel Prize. I knew the tone of this book before I knew anything else. That was the one thing that I had from the first sentence—the sound of it—and it’s what I would come back to when I was lost. Sentence by sentence, I knew when it sounded right, when the angle of vision was correctly honed, and that more than anything else is what I was able to trust. I’m not sure where it came from, but I knew the book needed levity, I knew it needed a clear element of comedy to carry it, and all of that could be managed through the tone. The great thing about levity, for me, is that it creates space for genuine sentiment, for unexpected moments of regret or longing or generosity to come through. As for the term “one-percenter” it was used by a reviewer (or more likely his headline editor). I didn’t actually know the term when I was writing the book since much of the public dialogue about income inequality that spawned it hadn’t yet begun. But I agree “one-percenter” isn’t quite right for Anders, even though he probably technically would qualify as one. And I think that’s because one of the things that I was interested in when I was writing it was the nature of work, in particular the way that it always seems to be at odds with personal freedom, even when we might believe it’s in the service of it. So it was important that Anders was a commuter, a guy who had to get up at five and get on the train to head into the office, a guy who was ham-strung by a huge mortgage and astronomical property taxes and tuition bills for his grown kids. A one-percenter, at least in the popular imagination, is someone who lives in a kind of frictionless world where he doesn’t have to do anything he doesn’t want. And that’s not this character. So for me, the novel has less to do with wealth than it does with responsibility, which is another way of looking at what’s expected of him, or more precisely what he feels is expected of him. Reviewers have compared you to Updike, Cheever, and Yates, and those comparisons seem inevitable given the novel’s subject matter. Still, what intimidating comparisons! They’re among the titans of 20th Century American fiction. Was working in their style was ever difficult, either because of their influence on your writing or because of their influence on the agents, editors, and other readers who might have been offering advice to you? Yes and no. Mostly I took great comfort in their work. Particularly Yates. I think when you’re working on a novel, especially a first novel, you’re constantly worried if anyone could possibly care about the story you’re telling. This at least was a fear of mine, one of the greatest hits of my many doubts. So knowing that there was this huge swath of American fiction that had come before me, this grand beloved tradition, helped a lot. When it came to the writing, I didn’t worry much about imitating them, since the voice of the book always felt like my own and the world of the book was certainly my own, comprised of all the sense memories and settings of my childhood. Not to mention the fact that, you know, those writers are all masters (and, I would argue, very different). But I did use their work to help me find a form. And that was hugely important. It gave me permission to tell this story.